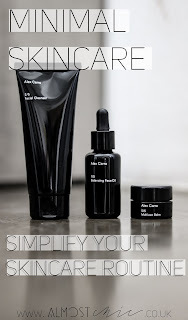 Reveal the Results // Perricone MD | Almost Chic. Perricone MD has been hovering on the outer edge of my beauty vision for a while now. The hype around it was building steadily but personally I still wasn't sure exactly what the deal with this scientifically innovative skincare & make up brand created by Dr Perricone. Curiosity got the better of me and I've been sampling a handful of Perricone products for the last few weeks. Verdict's in; I'm a complete convert. It's definitely time to reveal the results to you guys and fill you in on how I got on with these luxury skincare goodies. Cocoa Moisture Mask because it makes my skin feel so good that it's tempting to use it every single day and it smells so good you could eat it! Blue Plasma Cleansing Treatment because I'm not a huge fan of non wash off cleansers. Great as an alternative to face wipes (aka skin devils) whilst travelling, at festivals etc. Since the skincare is an absolute win in my eyes I'm very interested to try Perricone's no-makeup makeup line - for those who want to enhance their skins natural beauty rather than disguise it. In general the injection of these products into my skincare routine did wonders for my face. My skin felt healthier, fresh and soft. All the best things really. If you want a break down of exactly what I thought of each product just keep scrolling past the pretty (in my own completely unbiased opinion) pictures. An indulgent mask for an intense hydration boost & immediately firmer, more radiant skin. This incredible mask quickly climbed the ranks to become my favourite face mask ever. It moisturises without being greasy and lives up to its claims to leave my skin feeling outrageously soft. Like that just want to keep stroking your own face kinda soft. Just me? As well as the tangible difference it makes to your skin, this mask also has serious feel good qualities while you're using it. Mainly thanks to the luxe-appeal of the beautiful glass jar; the satisfaction of massaging the product into your skin while the micro particles burst to unleash more chocolate-y goodness and most importantly the good enough to eat cocoa scent. Warning: may cause overuse of the phrase treat yo self. But seriously it's such a treat to use this mask that I've had to limit myself to only 2-3 times a week because I never want the jar to end. There was a period when I couldn't resist using it everyday (there may even have been one particularly self indulgent day when I used it twice. TREAT YO SELF.) Despite this initial make it rain approach to mask use - my jar has lasted extremely well. You only need a small amount (maybe 3 pea sized blobs) so there are a lot of uses in one jar. I estimate that I've used it at least 20 times and theres still half a jar left. So so worth the splurge if you're looking to invest in a new mask. Soothes and deeply hydrates sensitive, dry and irritated skin. Perricone MD have absolutely nailed it with a fully hypoallergenic, perfume free moisturiser that still feels indulgent and rich. Something I personally find that brands, from the cheapest of high-street right to the costliest of high end, often struggle to execute. The amount of times I've splashed my pennies on a hypoallergenic product only to find that, yes, it doesn't irritate my skin but doesn't do much else either. They tend to resemble something horribly bland and not user friendly that the doctor might prescribe you for a spot of eczema (double/dipro-base haters where you at?!). Perricone's nourishing moisturiser is the one exception I've found and I LOVE it. It's very moisturising and soothing, as is the claim. Deeply cleanses whilst gently exfoliating and conditioning the skin, leaving it instantly radiant. Is it just me that never trusts any "no-rinse" cleansers/makeup removers?! Surely without rinsing there has to be remnants of general grime left behind by my cotton pad? When I tried this one though, I didn't hate it like I expected to. It does cleanse very well. When I used it with a cotton pad it removed most of my makeup on the first sweep over, including stubborn waterproof mascara. However, it did take a second go before my face felt completely clear and makeup free. On minimal makeup days/no makeup days you could definitely get away with one cotton pads worth. Although the cleansing treatment did remove my makeup (the evidence was on the cottonwool) I still found myself rinsing my face after and/or double cleansing with another product because I just didn't feel like everything was completely gone. Hence I'd say this product is great as one of the steps in a double cleanse routine - either as the first step almost like a micellar water or as the second step used in place of a toner since it is supposed to have a multitude of ingredients which treat the skin as well as the cleansing ones. The best use for this product, in my opinion, is as a travel cleanser. I have found it to be amazing on flights and a few recent camping escapades I've been on recently. Anywhere you feel like your face needs a bit of a freshen up but a full skincare routine isn't an option. The bottle is the perfect size for this as, at 59ml, it doesn't take up too much space and is in line with the 100ml in flight rule. You'll never reach for a face wipe ever again once you've tried this instead. A definite essential for any festival go-ers and frequent fliers! Targets and eliminates dead skin cells, while rebalancing your complexion's hydration. I found this product most interesting. I'd never really tried anything like it - a non-acidic peel to exfoliate the skin. It has two active ingredients to do the magic. Number one is salmon roe enzyme, which has a similar effect to a chemical peel, attacking dead cells only, but without irritation. The other is copper which is supposed to improve elasticity, tightness and overall appearance of the skin. I loved the idea of an exfoliator that didn't involve any nasty scrubbing. First up I feel I have to mention that this product does not smell great while you're applying it. But don't let that put you off! It gives off a slight, umm, fishy scent when you first squeeze it out of the dropper. Don't be alarmed - this quickly disappears to become completely scentless once it's on your skin. Secondly, this wasn't really as skin overhauling as I hoped it would be. Yes it didn't irritate my very sensitive skin and I didn't experience any dry scaly patches while I was using it, so maybe it was keeping them at bay. Other than that though, I didn't really notice that it did do much. Unfortunately I found it a bit disappointing for this reason. Still might be worth a try if you really struggle with scrubs to exfoliate as it is very gentle. Just maybe a bit too gentle for me? Overall I was definitely impressed with my first experience with Perricone MD and would love to sample a few more products from them, especially from their hypoallergenic range. I strongly recommend you try the Nourishing Moisturiser if you're a wee sensitive flower like me. Do you have any favourites you think I should try? Now I'm off to apply another lashing of the Cocoa Mask because its been too long (it's been a day, help me I can't stop...). This brand sounds amazing! So up my street!